What the heck is a vector file (and why do I need one)? One of the more confusing aspects of the computer world has always been the wide variety of file formats. You create the perfect document and half the people you send it to can't open it. How frustrating! Or you design an awesome logo in Word and the sign shop or newspaper say they can't use it. They tell you they need a vector file. Why are these things so complicated and what the heck is a vector file? In the early years of computers, a file format depended largely on what software you were using to create the file. If you sent the file to someone who did not have that same software on their computers, they wouldn't be able to open it. It was a battle, in a way, between software developers - who would win and have their file format be the dominant choice? But we've come a long way over the last 20 years and there are now standard file formats that can be exported by any software and viewed by all computers. For the purpose of this article, I'm going to discuss Graphic File Formats only. These fall into two categories - vector and raster. Vector image formats contain a geometric description which can be rendered smoothly at any desired display size. I refer to vector as 'line art' as opposed to 'painting' - you create vector artwork with a pen. But rather than dragging the pen across the page you created a dot and a line is immediately created to join your dot with the last dot. Each dot has 'handles' that you can manipulate to create curves. Software that creates vector files includes Adobe Illustrator and CorelDraw among others. The universal file format for vector is EPS although PDFs can also be vector. OK fine, you say. What's the difference? Raster images look great at the size they were created. However, enlarging them degrades their quality and produces an image that looks pixelated and messy. You might decide to make the image exactly the size you need it but then you have a file that is so big you can't upload it to your site or email it to your friend. 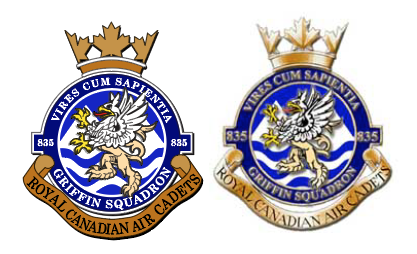 In the images below you can see two crests used by the Squamish Air Cadets. Actual size, they both look good but when enlarged you can see how vectors enlarge perfectly and rasters do not. Vector images look great at all sizes, and can be enlarged or reduced with zero degradation. So for example, if you create a logo about 4 inches square, you can send it to a sign shop and they can enlarge it to 4 feet square for your new office sign, and it will look great. You will need a Vector image if you want a sign made, or if you want decals cut for your truck, or if you want a ball cap embroidered or T-shirts printed with your company logo. A rule of thumb is this: Raster for anything to do with computer screens, vector for everything else (including print, signs, promotional material, and advertising). But even saying that, your web designer is going to ask for a vector version of your logo if you have one - this will make it easier for her to experiment with large or small versions, change the colour to white or overlay the logo on a photo etc. Vector is much more flexible for graphic design. Raster images cannot be manipulated. Vector images can. 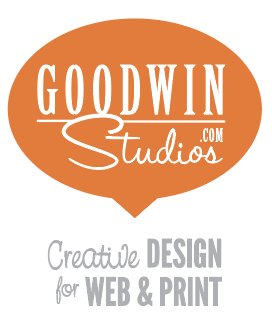 Let's look at the Goodwin Studios logo. As a rasterized image (jpg) you cannot remove the white background, or move the point of the bubble or rearrange the text. But as a vector image (eps), each element is a separate piece that can be moved around. As an eps too we can also alter the elements. We can change the speech bubble into a speech square if we want, for example. Raster images cannot be removed from their background. Vector images can be placed on top of a coloured background or photo and the background will show through all its open bits. Below the vector (left) and the raster (right) files have been placed on a black background. Raster images cannot turn into vector images. If you open a jpeg in your software and save it as eps or pdf, this does not change it into a vector. However, if you open an EPS in your drawing program, you can save it as PDF, JPEG, or PNG easily. This is another reason why starting with vector is the best way to go with company logos and brands. BUT I'VE MADE SOME BEAUTIFUL GRAPHICS - WHAT CAN I DO? OK, so this is the area where raster paint programs are the clear winner. Most people are are not able to create vector files. The software is typically difficult to master, especially the bézier curve tools and there aren't as many 'free' drawing programs out there. Painting with brushes and pencils and palettes is far more intuitive and popular with most users. If your uncle's nephew's friend in an art course at high school is going to design your logo, it's likely she will be using a paint program. If you're creating works of colourful art for your company signs, it's likely they're going to have to be 'digitized' before they can be used. Raster looks lovely on the web. In fact, you'll have to convert your vector into raster in order to put them on the web! But for any non-web uses you'll need vector. There are a few things you can do with your raster artwork to make it usable as a vector graphic. There is a function in drawing programs known as 'trace'. If your logo is a clean one colour shape and a known font, it can be brought into the drawing software and 'traced' at the click of a mouse. As a rule, though, trace doesn't work very often. The logo would have to be extremely clean or the tracer will trace every little mark and smear. Also, the logo has to be simply coloured or the tracer will get confused. Tracing works well with line art. If your logo has been sketched or drawn it's possible a graphic designer will be able to trace it. If the font is known, the graphic designer can erase the raster words and retype to create a clean look. If you're not sure what your logo font is, you can try to find it on this website: WhatTheFont (http://www.myfonts.com/WhatTheFont/). Upload your raster file and the website will attempt to identify the font used. Traced artwork can then be saved as an EPS. 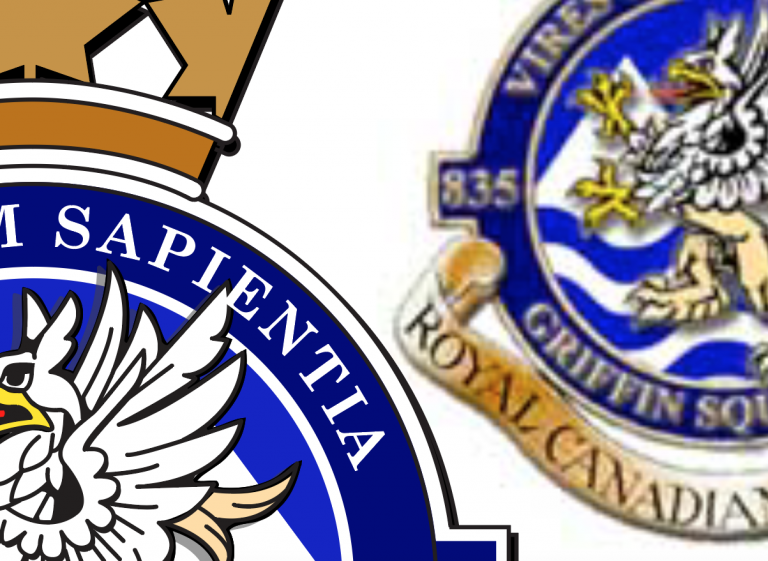 The Squamish Air Cadets Crest was digitized from a raster file.  Their raster logo looked good enough on their MS Word letterhead but was not usable for T-shirts and embroidered crests. It took a graphic designer 4 hours to digitize this logo. If your logo needs to be digitized, you can expect to pay for this service. If your logo is simple enough, it might not take very long. A font, a curve or circle, these are easy to recreate with vector software. 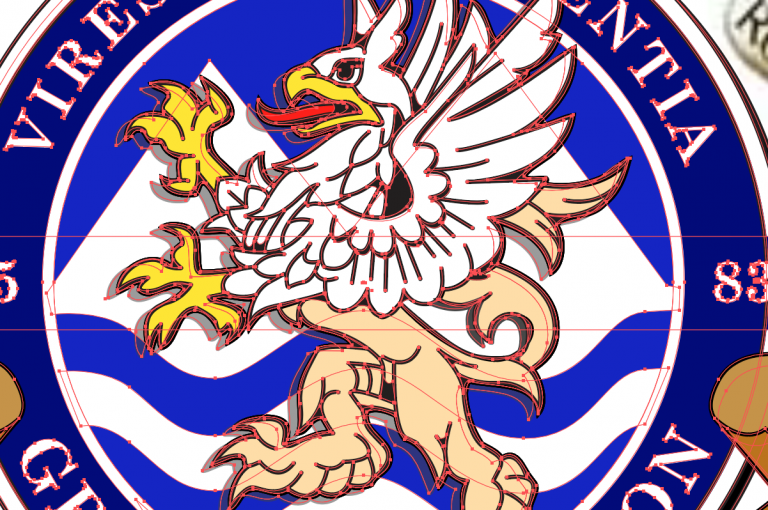 The process involves bringing the logo into the drawing software as a background and then tracing its lines and applying the colours then saving as EPS. If your logo or branding artwork is a complicated painting - of mountains and ocean perhaps, or forest, or a bear by the side of a stream - it will not be possible to digitize it exactly.  You will want to hire a graphic designer to create a stylized version of your logo - something with fewer colours, simpler lines. You can still use your painting for online purposes and even on digitally printed pieces such as posters and banners. If the company or organization has ever had signs made, or vehicles decaled, if you can find out what sign shop they used, you'll find your digitized logo! Although print material can now use raster logos, newspapers and print shops prefer vectorized logos for all the reasons stated above. If your company or organization advertises with a local paper, it's likely that paper has your vector logo on file.